Home / Stories and Information / FAQs / Diamonds / Diamond Fluorescence – What’s It All About? More recently, we have noticed that customers are enquiring about diamond fluorescence. There seems to be a little bit of confusion or whether its a good or bad thing and how it impacts on the overall diamond quality and appearance. So, what’s it all about? Fluorescence is the visible light some diamonds emit when they are exposed to invisible ultraviolet (UV) rays. On a GIA (Gemological Institute of America) diamond grading report fluorescence refers to the strength, or intensity, of the diamond’s reaction to long-wave UV, which is an essential component of daylight. The light emitted lasts as long as the diamond is exposed to the ultraviolet source. Yes. Of the diamonds submitted to GIA over the past decade, approximately 25% to 35% exhibit some degree of fluorescence. However, only 10% of those show strengths of fluorescence that may impact appearance (i.e. strengths noted on laboratory reports as medium, strong or very strong). 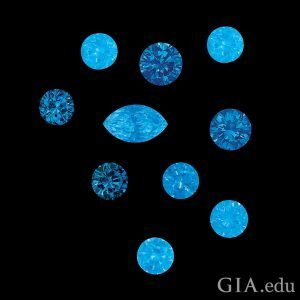 In more than 95% of the diamonds that exhibit fluorescence, the colour seen is blue. In rare instances, the reaction is yellow, white or another colour. GIA studies show that, for the overwhelming majority of diamonds, the strength of fluorescence has no widely noticeable effect on appearance. In many instances, observers prefer the appearance of diamonds that have medium to strong fluorescence. In rare cases, some diamonds with extremely strong fluorescence may appear hazy, oily or milky; fewer than 0.2% of the fluorescent diamonds submitted to GIA exhibit this effect. No. A diamond that fluorescence has the same integrity as one with no reaction to UV. Submicroscopic substitutions and/or shifts in the diamond structure can cause fluorescence as well as prevent it. Nothing in either instance inherently weakens or is bad for the diamond.